You want the best-looking hair extensions on the market, so you go do some research online. All of a sudden, you see all these places discussing 100% remy hair, synthetic hair, virgin hair, and so on. But what are all these things? You hear that remy hair is good quality, but why? 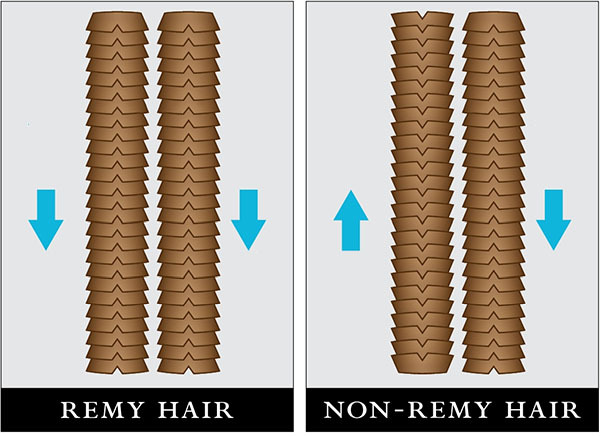 To make your life easier, here’s a simple explanation of what remy hair is and the difference between remy vs non remy hair. To put it simply, remy hair is 100% human hair that has all the strands of hair running in the same direction. That means that all the ends of the hair are together, as are the tops - just like the hair on your head is organized. Why is this a big deal? Human hair is made up of layers of tiny little pieces of keratin, a protein, stacked on each other. The outermost layer is called the cuticle. Like a cat’s fur, the cuticle runs in one direction - from the scalp to the end of the hair. When you pet a cat from head to tail, the cat likes it and purrs. If you pet a cat from tail to head, their fur starts sticking up, it’s uncomfortable, and they may try to bite you. Minus the biting, the cuticle works the same way. When it gets rubbed in the wrong direction over and over, the pieces of keratin start to spread apart and stick up and the friction causes the hair to tangle. Having the strands of hair in extensions facing different directions is one way to make this happen. That’s why having the hair organized correctly is so important. As you may have already guessed, non-remy hair is hair that does not have all the strands running in the same direction. In general, the absence of organization tends to lower the cost of the hair extensions. However, they don’t look as natural and they tend to tangle more often than remy hair. To get around this, a lot of non-remy hair has the cuticle removed from it. It’s shaved off, reducing friction between the strands of hair and resulting in less tangles. While the removal of the cuticle does create some benefits, you should keep in mind that it also damages the hair. This usually means that your extensions won’t stay in the same great shape that remy extensions would after you've worn them for a while.